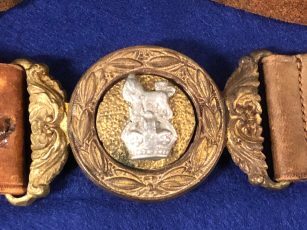 Photo Credit: Nan Martin BCHNS Antique Silver Nursing Sisters Belt: Late Victorian or early Edwardian steel-cut silver. Acquired by Edith Hatfield [1905-1984] as a gift from relatives in Britain; they liked to browse antique stores and sent it to her as the “nurse” in the family. Edith graduated from both UBC and VGH in 1929 and embraced the new field of provincial public health and school nursing. 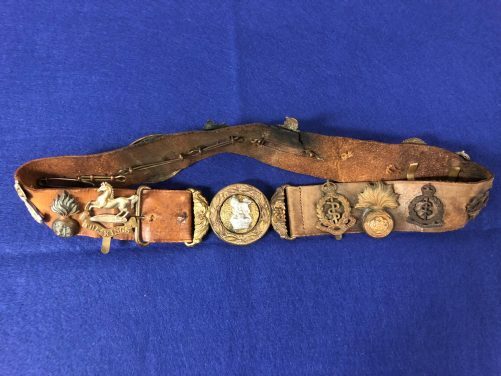 World War 1 Nursing Sister’s Belt with Memento Badges. Refer to Online Exhibits/Presentations document for full description of belt and badges.